Just after MPs pocketed a 10% pay rise they voted for yet more social security cuts. The only Labour Party leadership candidate to oppose the cuts is Jeremy Corbyn. Unsurprisingly he is now ahead in the polls and likely to increase his lead after these comments. From Tony Blair, “I wouldn't want to win on an old-fashioned leftist platform … If your heart is with Corbyn get a transplant” From Blair's former adviser, John McTernan, “These figures are disastrous for the Labour party, disastrous. Corbyn supporters are “suicidally inclined … They need their heads felt … They are morons.” Today I am going to join the suicidal and the morons. As someone who has always argued that participation in the parliamentary road is tantamount to disturbing the dead, this is a big decision for me. 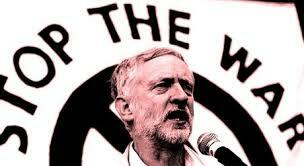 But Jeremy is my local MP and has always stood against neo-liberalism, against war, Trident and for Palestine. Anyone can vote in the Labour Party leadership election, which is now run on the basis of one-person-one vote and is open to a new category of Labour supporter. Registration as a supporter costs just £3. Join me. Then read more about what I think about disturbing the dead in 'Left Field'. Who are 'Left Field's' publishers? The art of an "angel"